Here is a rundown of the biggest fights of the weekend. Heavyweights – Former Light heavyweight Champion of the World, Antonio “Magic Man” Tarver won a 10 round unanimous decision over Nagy Aguilera with all three judges agreeing on 98-92 scorecards. Tarver, who was coming off a 17 month layoff and fighting as a heavyweight for the first time in his career, had no trouble with the limited Aguilera. He will continue to campaign at heavyweight and improved his record to 28-6. Aguilera has now dropped three of his last four, as his record fell to 16-5. Tarver may be able to beat limited heavyweights, but I find it hard to believe he will be able to compete with the top guys in the division, even though the division is limited. Welterweights – Cleveland/Akron Welterweight prospect “Showtime” Shawn Porter put a beating on Hector Muñoz, forcing his corner to convince referee in charge Gary Ritter to call a halt to the bout at 2:05 of the 9th round. Porter didn’t score any knockdowns in the fight, but he was able to hit Muñoz with anything, at anytime during the fight. He improved to 17-0, 13 KO’s. Muñoz didn’t appear to be hurt during the fight, but did suffer to cuts due to accidental head butts that affected his vision as the blood was going into his eyes. He’s winless in his last four fights and dropped to 18-4-1 overall. I said going in that this fight was a mismatch, and clearly it was. 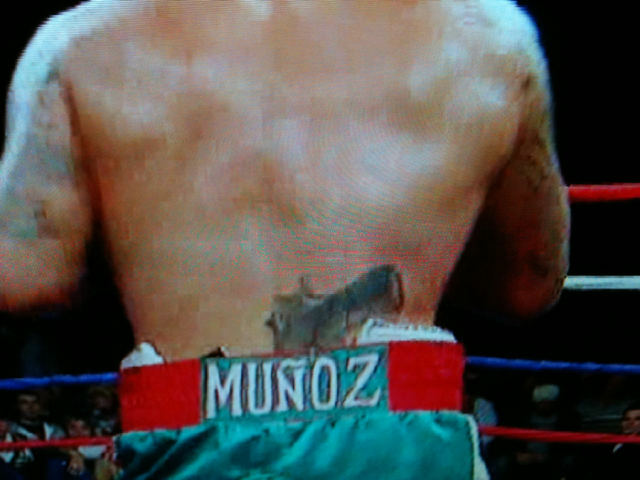 Muñoz would be better off getting more horrible looking prison tattoos than being a prizefighter, unless he’s just going into fights to collect a check and take beatings. 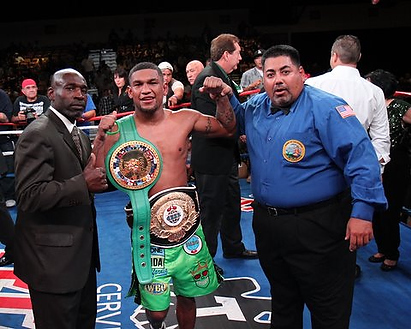 Super Featherweights – Eloy “The Prince” Perez won a hard fought majority decision over Dominic Salcido by the scores of 96-94 twice, and 95-95. Perez used his jab to control the fight early on, and then was able to outbox Salcido late to win a fight that didn’t appear to be as close as the scored indicated. He improved to 19-0-2. Salcido didn’t do much at all early in the fight and when he started to engage with Perez, it was too little too late. He’s dropped three of five and is now 18-3 overall. Overall the fight was a dud, as the crowd booed throughout the fight. Perez is lining himself up for a shot with Ring Magazine #2 rated Super Featherweight Ricky Burns. There is no legit Super Featherweight World Champion. Welterweights – Frankie Gomez won a six round unanimous decision over Ramon Montano by the scores of 60-54 twice and 58-56. Gomez didn’t score any knockdowns in the fight, and went the distance for the first time in his career. He upped his record to 7-0. Montano has lost four of six, but has never been stopped in his career. He serves as a good opponent for prospects that need to get rounds under their belt. He is now 17-8-2. Gomez is one of the bright young prospects in all of boxing, at just 18 years of age. He’s already fought seven times, since turning pro seven months ago. Super Middleweights – Ring Magazine #1 Super Middleweight Lucian “Le Tombeur” Bute knocked out Jesse Brinkley at 2:48 of the ninth round. Bute scored three knockdowns, all via the uppercut. The last one forced Binkley to concede that he had had enough. It was the fourth straight knockout for Bute, who improved to 27-0, 22 KO’s. Brinkley fared better than most thought he would, but still didn’t have the skill set to seriously compete with the #1 Super Middleweight in the World. His nine fight winning streak ended as he fell to 35-6 overall. With a fight between Bute and #2 rated Andre Ward still a while away, fans may have to settle for a fight between Bute and former World Middleweight Champion Kelly Pavlik, which is an excellent matchup. Light Heavyweights – Ring Magazine #6 Light Heavyweight Adrian “The Shark” Diaconu scored a ten round unanimous decision over Omar Sheika by the scores of 98-91, 98-92, and 97-92. Diaconu survived a second round knockdown in his first fight in ten months. He improved to 27-2 overall. Sheika gave a valiant effort and it’s because of fights like this, which was an absolute war, that he is closer to 43 in terms of boxing age, then his true age of 33. What a fight. Incredible action throughout, with Skeika providing a much better showing that I expected. Diaconu looked rusty, and he needs to continue to get in the ring, but he will need a little time off after this one. Let’s just hope it’s not another ten month layoff. 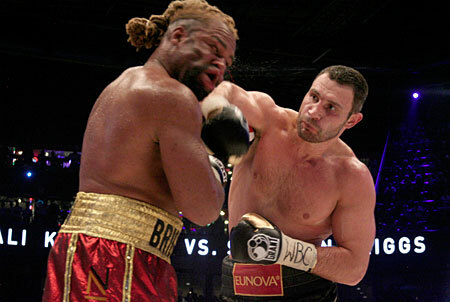 Heavyweights – Ring Magazine #1 Heavyweight Vitali “Dr. Ironfist” Klitschko easily dominated Shannon Briggs en route to a 12 round unanimous decision by the scores of 120-107 twice, and 120-105. Klitschko was dominant again, this time against the tough as nails Briggs. He Improved to 41-2. Briggs showed a granite chin and a huge heart as he refused to go down, despite taking an enormous beating. His record is now 51-6-1. I can’t believe this one didn’t end early, as the referee and corner for Briggs both acted carelessly as they let Briggs suffer way too many shots, which led to him having to be observed in a German hospital after the fight. It’s really too bad that Vitali and Wladimir won’t fight each other. Cruiserweights – Ring Magazine #9 Cruiserweight Ola “Kryptonite” Afolabi won a ten round unanimous decision over Sandro Siproshvili by the scores of 100-90, 98-92, 97-93. Afolabi had been out of action for ten months and it showed. He improved to 15-2-3. Siproshvili had a good showing despite the loss. He fell to 24-7. Afolabi needed a fight and he got one. He’s scheduled to return to action in December in Germany against an opponent to be determined. Jr. Featherweights – Ring Magazine #9 Jr. Featherweight Wilfredo “WV2” Vazquez Jr. stopped Ivan “Choko” Hernandez at :50 of the 11th round. Vazquez Jr. put on a good performance and jumped on a still hurt Hernandez at the start of the 11th round forcing referee in charge Telis Assimenios to stop the bout. It was the fifth straight knockout for Vazquez Jr., who improved to 20-0-1, 17 KO’s. 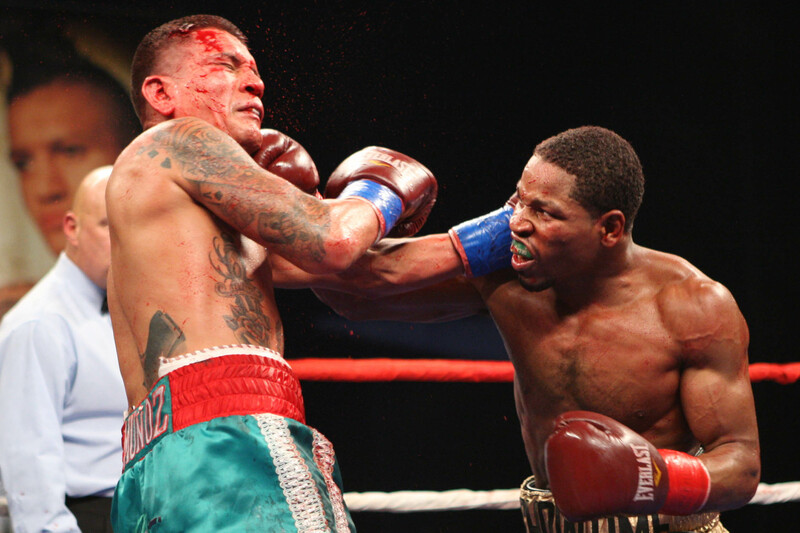 Hernandez was game in defeat, as he appeared to hurt Vazquez in the seventh round. His record fell to 28-5-1. Vazquez Jr. continues to impress, something that is hard to do as a son of an all time great. He will have to go to Asia more than likely though, if he wants to become the legit World Champion of the division. Flyweights – Ring Magazine #8 Flyweight Julio Cesar Miranda destroyed Michael Arango, knocking him out at 1:30 of the second round. Over his last five wins, Miranda has scored five knockouts. He improved his record to 34-5-1, 27 KO’s. Arango was knocked out for the third time in his last five bouts. He’s now 31-10-3. This was just a stay busy fight for Miranda, who is looking to stay in the ratings and get another crack at Flyweight World Champion and pound for pound elite Pongsaklek Wonjongkam, whom he lost a decision to last April. Heavyweights – Ring Magazine #3 Heavyweight Alexander “Russian Vityaz” Povetkin knocked out Teke Oruh at 2:57 of the fifth round. The knockout blow was a right hand from Povetkin, who scored his third straight knockout victory and improved to 20-0, 15 KO’s. Oruh, who hasn’t won a fight since 2007, fell to 14-3-1. Before this fight I didn’t understand what this type of fight would help Povetkin and his trainer, Teddy Atlas with, in terms of experience. This was a joke of fight for someone with the elite skill set as Povetkin.